The shores of Lake Baikal in Siberia, the world's largest body of fresh water and popular tourist destination, are covered with rotting algae dangerous to its unique ecosystem. Baikal is getting increasingly contaminated by spirogyra, which could pose a threat to the purity of its waters. Spirogyra is not native to Baikal's ecosystem. It thrives on biological waste which, according to ecologists, is provided in abundance by the sewage facilities of the local holiday centers, as well as private boats. Now, most of Baikal's shores are covered in rotting spirogyra. Only the western shore remains clean. "It has never been detected previously in such a mass abundance. Spirogyra is completely occupying more than 50 percent of the coastal area of Lake Baikal," says Oleg Timoshkin from the Limnological Institute of the Russian Academy of Sciences. The institute researches the flora and fauna of Siberian lakes. "Last year, there was more than 1,500 tonnes of rotting algae. Unfortunately, I can definitely say that Baikal is ill. Seriously ill."
Baikal's unequaled purity is in part due to an endemic sponge, lubomirskia baicalensis, which feeds by filtering water. The spirogyra, while harmless by itself, infects the sponge, thus threatening the lake's pristine state. But the alien algae aren't the only threat Baikalis facing at the moment. Its water level is at a record low – 5cm below the critical level of 456 meters, according to a source in the local emergency services who spoke to RIA Novosti. The level hit critical just three weeks ago. This has led to the Republic of Buryatia, whose territory includes Baikal's eastern shore, declaring a state of ecologic emergency. The officials have also asked the local population to start saving water. They say the draining could cause irreversible damage to the lake's unique ecosystem and leave almost 30,000 locals without water. Some local ecologists blame energy companies for over-using Baikal's water reserves. "At the beginning of the season, in April- May, hydroelectric power plants flushed increased amounts of water, while they should have been saving water in the lake," said Endon Garmaev from the Siberian branch of the Russian Academy of Sciences, as cited by Rosbalt news agency. "The flush continued throughout the summer. Energy from hydroelectric plants is the cheapest, and [nearby city] Irkutsk power companies are after a bigger profit." However, experts from Irkutsk Region, on Baikal's western shore, say there's nothing to worry about, and the dropping water levels are a natural result of ecological cycles, following an unusually dry summer. 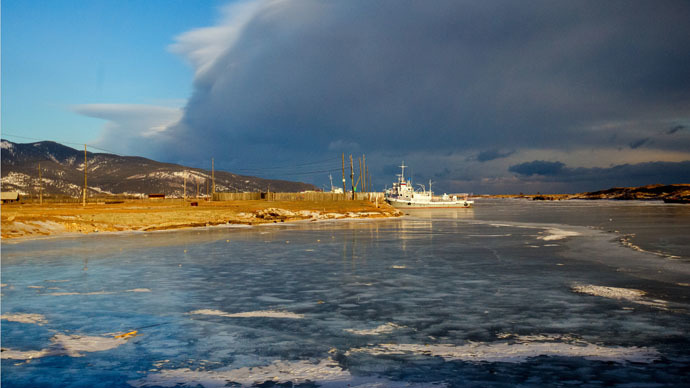 "Throughout the existence of the Irkutsk hydroelectric power plant, despite several emergency cases, nothing happened to the lake's biosystem", claims Mikhail Grachev, director of the Limnological Institute, as cited by lenta.ru. Baikal is the world's oldest freshwater lake, about 25 million years old. It holds one-fifth of the entire planet's freshwater reserves. The importance of its protection has been stressed by UNESCO, which declared it a World Heritage site in 1996.